Ugly Accent Table Upcycle-A Little Fabric Goes A Long Way! Monday’s get me down, but rainy days don’t! It has been raining all weekend and what better indoor therapy is there, than starting and finishing a new project! Last week, I was on my lunch break and something told me to stop in the local Good Will Store. The last time I was in this store I was very disappointed with their prices and stock. I am glad I listened to my “thrifty senses” and gave it another try. As soon as I walked toward the back of the store where they keep all the furniture, I noticed the little rocking chair sitting there. Before anyone else had time to notice this little “diamond in the rough”, I snatched it up. I knew this was not going to be easy. The chair was black lacquer and in several places on the chair, it looked like a small dog had chewed on it. The chair was also loose, but appeared it could easily be tightened up. The chair was priced $6.99, which was a bit steep for an item in this condition, but who knows when I might find a kids rocking chair again? I took it home and hand sanded the areas where the wood was damaged until it was smooth. I then used two coats of latex primer and painted the entire chair. Once dry I began the process of working out the color scheme and hand painted the chair using acrylics.This took a while as when dry I had to add additional coats. 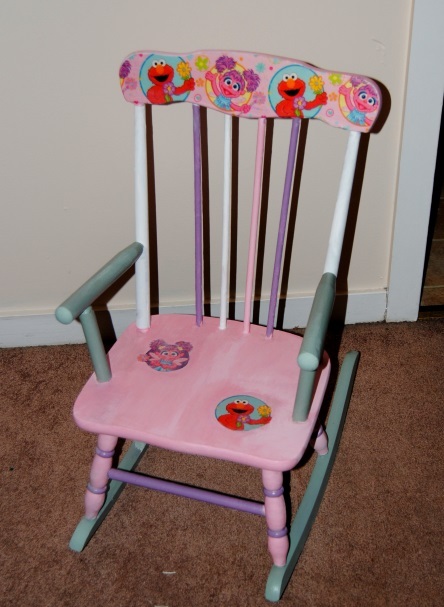 Once the chair was painted, I used Sesame Street wrapping paper for the chair back and on the seat. 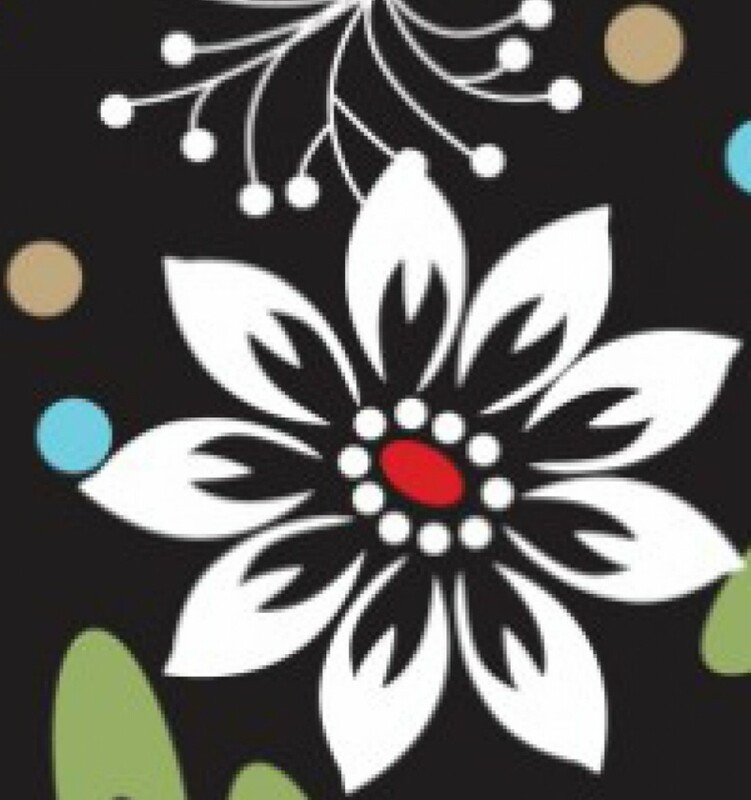 I glued the wrapping paper down with Mod Podge carefully smoothing out any air bubbles. 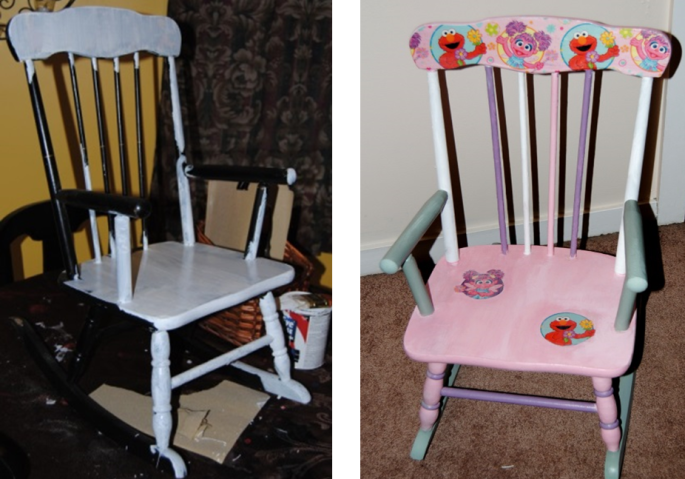 Once dry, I coated the entire chair with Mod Podge matte finish and repeated a total of 3 times. The result is what you see here. 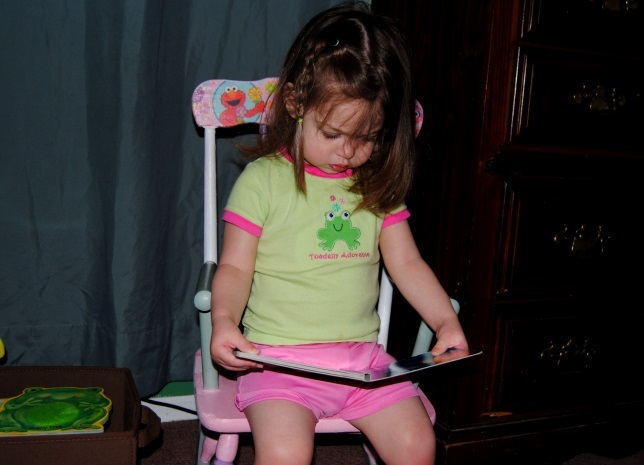 Now, My little girl will have her very own chair to sit on and read in her room. I think I am in love with kids furniture!